The spring garden is awake and alive in pastels and grace. Pinks, lavenders, and whites are accented with touches of yellow and an abundance of shades of green. Speckled violets, viola faces, and bells of lily-of-the-valley are tiny treasures. Flowering trees look like popcorn trees, burdened with blossoms and waiting for leaves. The bleeding hearts are laden with tiny red hearts, showing teardrops and reminding us that life isn't always as we plan or choose. Fragrance and flowers; representing hope and grace. Your garden is wonderfully awake for sure. Love all those pastels and all the variety there. You did a super job on that mosaic, too. 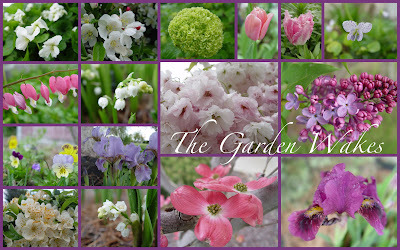 I've been working on a collage of my garden too ..the colors this time of year are my absolute favorite. . our gardens appear to be very similar right now. . .just so beautiful.